Hampi, a city carved in stone is one of those kinds of destination which is a must visit if you call yourself a traveller. The ancient ruins of Hampi reminds us of the glory of the Vijayanagara Kingdom. Once the richest city in the whole World, it has so much in its lot to keep you engaged and entertained for a very long time. It is recommended you spend at least a week in Hampi to sink into its roots and experience the grandeur of this beautiful city of stones. As per the various archaeologists and historians who studied in detail about this ancient Viajayanagara City, there are more than 4000 temples in Hampi, some of which are in very bad shape and therefore, are no longer of any interest to the travellers. The major attraction of Hampi is its rugged landscape dominated by the ginormous boulders and the famous Tunghabhadra River. The legendary Vitala Temple stands testimony to the architectural brilliance of the Vijayanagara Kings. Its surreal architecture will leave any gazer stand in awe. Next up is the mighty Virupaksha Temple of which the architecture is no less mesmerizing as well. The Achyutharaya Temple, the Matanga Hill, the Hampi Bazaar, the Queen’s Bath, the Anjanadri Temple and the Lotus Palace are some of the other prominent attractions in Hampi. Owing to its rich history and classic architectural heritage, it was declared a World Heritage Site by the UNESCO under the name, the “Group of monuments at Hampi”. 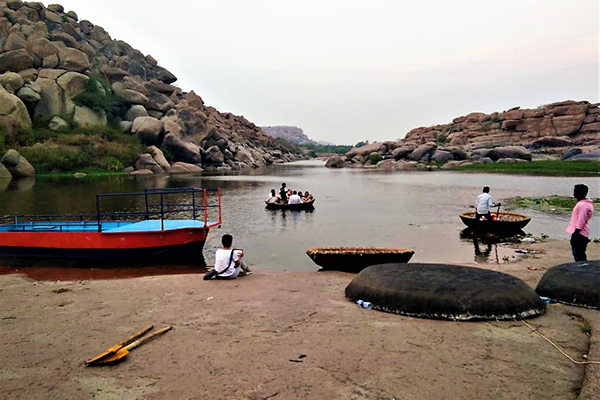 To make your Hampi tour fun and easy, our Indian Panorama travel nerds from Hampi have come up with the best recommendations for you to enjoy and experience this ancient city the best way possible. 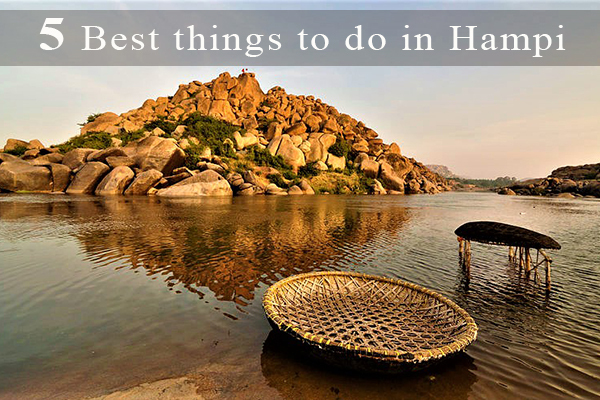 Here are our picks for the best things to do in Hampi. Hampi is best explored on a cycle. This guided Hampi Heritage Cycling tour provides you an in-depth experience of this ruined Vijayanagara Kingdom, once the richest city in the World. There is so much to explore. By walk you cannot finish it in a day and if you opt for a Car, you don’t get to feel the essence of Hampi. 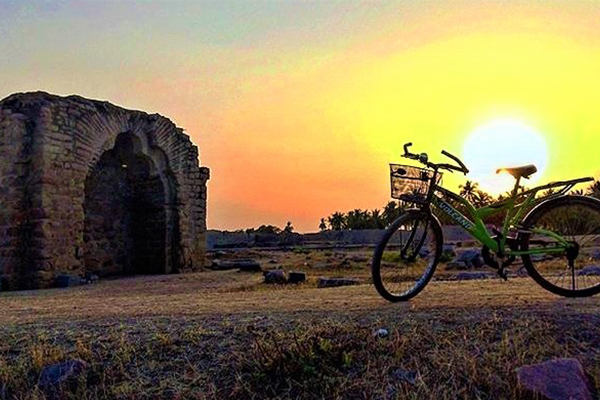 Instead, hop onto a cycle and follow our expert Hampi Storyteller, who will guide you to all the major landmarks of this UNESCO recognised heritage city. Meet our storyteller and Start off your cycling tour from the famous Virupaksha Temple. You will then come across the Hampi Bazaar, the Krishna Temple, the Badavalinga, the Queen’s Bath, the Hazaraama Temple, the Lotus Mahal and many other historical sites Hampi is famous for. Finish off your tour with a special South Indian Thali meal under a Mango Tree near the Underground Shiva Temple. How does it sounds? Cool right? It is indeed pure fun. This exclusive Hampi Cycling Tour is guaranteed to top your list of the best Cycling experience you have ever had. Anegundi is an ancient village near Hampi. It is better known as the Hippie Paradise owing of it’s out of the World natural beauty and rich cultural heritage. Set amidst huge boulders and on the banks of the Tungabhadra River, Anegundi is of huge historical significance. Mentioned in the Indian epic Ramayana as Kishkinda, the kingdom of Monkeys, it was home to the Sugriva who ruled Anegundi for many years. The very same fact that Anegundi holds a place in the Ramayana makes it even older than the city of Hampi itself. It definitely demands a visit. 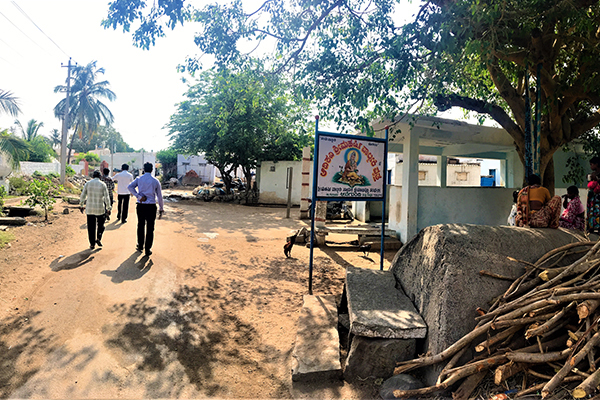 Through this exclusive Anegundi Heritage Walk, we guide you through all the major historical sites at Anegundi starting from the Old Vijayanagara area to its spectacular temples, ruined palaces, traditional houses and more. Our expert Hampi storyteller will enlighten you with his immense knowledge as he leads you through the rustic pathways of Anegundi Village. A Coracle is the most exciting and fun filled means to explore the Hampi countryside. It is a round shaped basket like boat made of reed, hide and sapling. It is used here locally as a means of transport to cross the river. Get onto one of these Coracle boats and start gliding along the gorgeous rapids of Tungabhadra River. Five stars to the Coracle ride. MUST TRY! Bullock Cart is an ancient means of transportation which was used all over India. It can be seen even now in certain parts of the country, mostly in rural villages. It is widely used by locals for transportation in Hampi and is yet another entertaining way to enjoy the Hampi countryside. 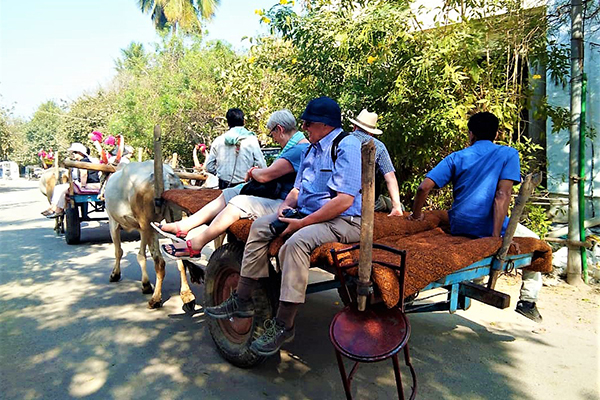 You will come across many unseen sights of Hampi during this exclusive Bullock Cart village tour. So do make a note of it. Never miss out a Bullock Cart ride at Hampi. If you are one of those avid travellers who are in love with Sunset and always look to find a spot to enjoy it no matter where you are, the Matanga Hill at Hampi is picture perfect for you. Sunset from this part of the planet is just “AWESOME”. It is also famous for offering a panoramic view of the whole Hampi area dotted with gigantic temples, the boulders, rice paddies and the Tunghabhadra River. A short but tiring hike will take you to the top of the Matanga Hill. Position yourself during the Sunset time. A magical experience it is indeed, to stand there and watch the blazing Sun slowly dip behind the distant mountains. Never risk missing it out. Remember “Sunset from Matanga Hill”. 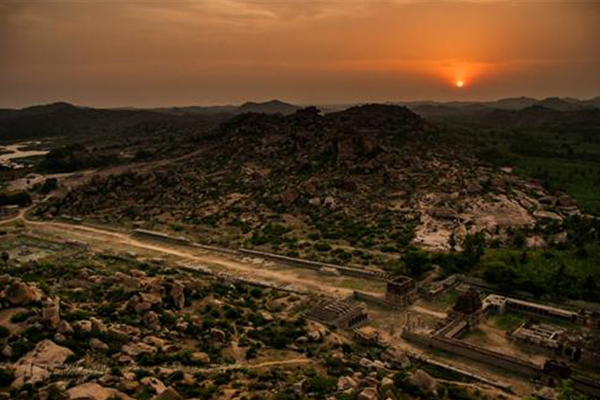 So that was our pick for you – 5 best things to do in Hampi. 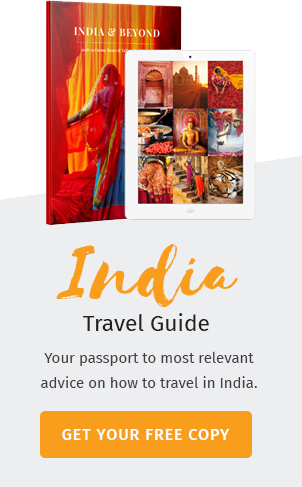 If you are planning for a Hampi Tour, let our expert tour consultants customise your tour with these exclusive activities and other best recommendations to help you make the most of your Indian Holiday. Interested? Comment below or leave us a message!